I hunt out of blinds a few times each year and they can be very effective, but the deer figure them out quickly. 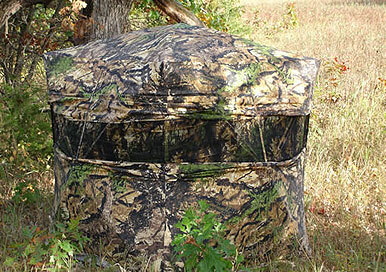 Here are a few tips for bowhunting from a ground blind that I've learned. First, if you want to hunt a blind within two weeks of putting it up, you must brush it in very well. Even if you are just placing it out in an open field, you need to add brush to break up the outline. My friends and I have set blinds and brushed them in and had deer around them the same evening. Without the brush, the deer hang back and sometimes even snort from the shadows without entering the field. Once the deer get used to the blind in the field, you can move it around and they won't pay much attention to it. That is a big advantage to getting the blind placed early and giving the deer plenty of time to get used to it. Again, as I said, giving them at least two weeks is ideal. Now here comes the main point: you can't let the deer ever know you are in there — period. They are already a bit suspicious of the thing. If they figure out that you are sometimes in there, they will avoid the blind. People tend to get sloppy once they get in the blind, sometimes making too much noise of moving in front of the windows to look at the deer. Again, it doesn't take much before they get blind-shy. Also, when it is time to leave, always have a diversion — someone who can drive into the field and run the deer off before you climb out. Use scent control and hunt very carefully and you can make a blind work well, but if you get the least bit sloppy the deer will pick up on your strategy very fast and then you are sunk.